This is the second of three posts on how I've implemented What's Best Next, by Matthew Perman. The first post can be found here. As we enter the next step, we're really getting into the heart of the practical implementation of WBN. I think I plan well. I know what I want to do and what needs to be done but it is difficult to implement the plan consistently. The analogy I use when talking to people about this step is budgeting. Some people have an awesome budget in place. They just have no way of comparing what they actually do with their theoretical budget. Planning and spending occur in two totally different universes for them. The same is true for planning our time. We may have wonderful goals and plans for how to spend our time. But what tools can help us merge our plans with reality? The "Execution" step gives us tools to help reality conform to our plans. Once again, you need to read WBN. What follows are some things I've done. I haven't arrived yet. To me, discipline in this area is like becoming physically fit. You have goals and you implement those goals one at a time on your way towards physical fitness. It's good to measure yourself by where you want to ultimately be, but that can also be discouraging as you see how far you still have to go. Therefore, it's also helpful to gauge yourself by far how you've come. How do you execute? Perman advocates a three-step process: Plan, Organize, Do. First, planning involves being diligent to sit down every week and plan out the week ahead, based on the projects and action steps on your agenda. Second, organizing means you have a solid system in place to deal with all of your “stuff”. As I tried to think through how to implement such a system, I decided to do two things. First, I bought and skimmed Peter Drucker's Getting Things Done (which Perman references frequently). Second, I read through how other people had used Evernote to implement GTD. 1. Don’t use inbox as to-do lists. 2. Collect all your information in one place. 3. Process the information: one item at a time and in order. Don’t keep looking at an email. Deal with it. 4. Organize and act. 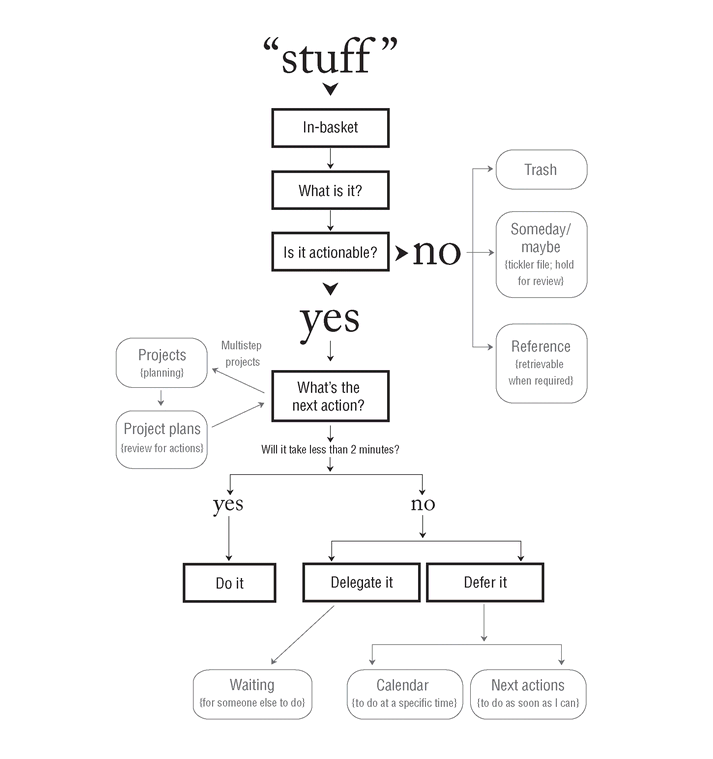 There are really only five possible things you can do with “stuff”: delete, file, do, delegate, or defer. Actions that can’t be done right away (two-minute rule), should be deferred to a projects list or an actions list. a. Large tasks are projects. Small tasks are actions. 1. 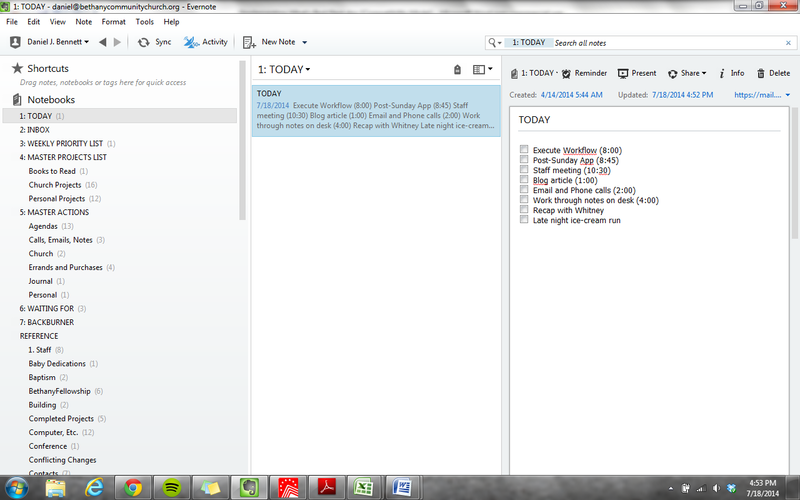 Plan your day: Create a project called “Today” in Evernote. 7. See your day in terms of people and relationships first, not tasks. 8. Ask in everything: How can I build others up? 9. Utilize the key question in the moment: What’s best next? Before reading WBN, I was using Evernote somewhat consistently. Perman uses other tools, but I didn't have the resources at the time to purchase some of the programs he mentioned. I also wanted to try to use one program instead of multiple programs/apps. In this Notebook, I created only one note, also entitled “Today.” In the note, I put things I’m planning on accomplishing today. Every morning, I review my weekly priority list and populate the items on this note mainly from those items. I’ll often put in parentheses a time I hope to have finished that item. In this note, I put items that I hope to accomplish for the week. Once a week (generally a Friday or Sunday afternoon for me), I will look at my Master Projects, Master Actions, Waiting For and populate in this note what I need to get done in the coming week. The things on this list are things that aren’t part of the normal routine. For instance, I don’t write “staff meeting” or “write sermon” because that seems silly to me. Each Notebook then has a bunch of notes, each of which is an individual project. For instance, the Notebook entitled "Church Projects" has multiple notes, each one a project I’m working on (e.g., The Gospel Institute or Asia Minor Trip). The middle column lists the various notes that are all in the notebook “Personal Projects.” Notice that the first note is a list of all the notes that are in the notebook. Also, notice that each project has a series of “next steps.” Reviewing these next steps helps me populate my weekly priorities. Anytime I come across a piece of information related to a project, I'll put it in the note that corresponds to that project. Looking above, for example, I see that in my "health plan" notebook, I've put in a link to some website. I may or may not use the information there, but it's there for me to look through next time I focus on that project (which should be a part of my weekly schedule). This is similar to the Master Projects list, but with actions instead of projects. The difference between an action and project is the number of steps involved. Generally, an action is a single step. These are items I’ve delegated and am waiting for someone to get back to me on. These are things that I will not be getting to in the near future but don’t want to forget about. These are just notes of information I want to have available in case I need them. The last step for me was putting everything through this new system. I collected all the info in my life. Notes, texts, emails, papers, etc. I pulled every thing I had out of drawers and "to do" piles and notebooks. After everything was in place, I ran every piece of it through this diagram (from Drucker's Getting Things Done, but don’t be thrown off. Those categories exist in your Evernote already (“Projects” is your “Master Projects” folder, etc.). It took me a good 2 days to finalize the implementation process. 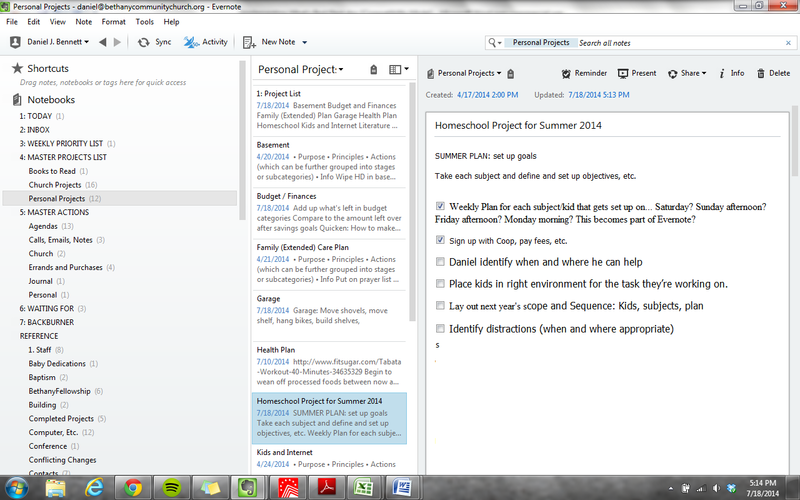 If I had a piece of stuff that was a project, I put it in the project folder of Evernote. Notes from a meeting were moved to a reference folder. Action items from the meeting were placed in my Master Actions note. I took a lot of pictures of documents and notes and sent them to Evernote and put it in the appropriate folder. In my next blog post, I'll talk through how WBN has impacted my ministry and personal life. 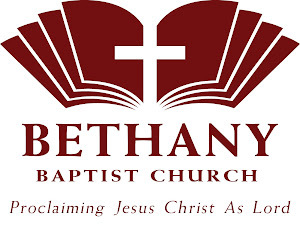 This is part one of a three-part series on how I've implemented What's Best Next in my personal life and ministry at Bethany Community Church. 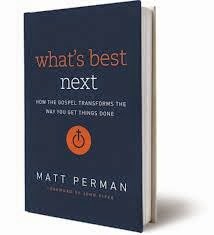 If you have spent more than half an hour with me over the past four months, you've probably heard me mention Matthew Perman's What Best Next (WBN). I'm an avid evangelist for the book and for those who are tired of hearing me mention the book (1) you'll probably want to stop reading now and (2) just be glad you're not one of my children...can you imagine being an eleven-year old and spending your summer learning how to implement WBN (kidding...mostly). When I discuss how the book helped me refine my ministry in some profound ways, I get the same questions: how did you go about implementing it? What were the first steps? In the book, Perman gives an "immediate application" at the end of each chapter. My first recommendation is to purchase the book for yourself and, if implementing the entire system seems overwhelming, begin with the small lifestyle changes he suggests. What follows here, however, are roughly the steps I took to implement some of the principles from WBN. As I read the book, I thought not only about how I would benefit from these principles but also got excited by different "nuggets" for each of my co-laborers. I think they've shared my excitement, for the most part, and these are also the steps we as a ministry staff are going through here at Bethany Community. It's important to understand why God is concerned with our productivity. The danger in reading a book like WBN is that it can become about efficiency instead of effectiveness. Such an approach misses the point of why God wants us to be productive: "More important than efficiency is effectiveness — getting the right things done. In other words, productivity is not first about getting more things done faster. It’s about getting the right things done" (43) . So I began by really trying to understand what Perman teaches about a God-centered view of productivity. While the core principle was simple enough (determine what the best thing to do is and do it), Perman's process of determining what the best God-centered, gospel fueled best thing to do was immensely beneficial. WBN employs the acronym D.A.R.E. (define, architect, reduce, execute). To begin even the first step, defining, it was important for me to understand the theology under girding WBN. The next thing I did was "define." I didn't implement this exactly as described in WBN, but I did follow the general categories. I determined my mission, values, roles, and goals. While I've always felt I had a pretty good handle on my mission and values, it was helpful to list out my roles and determine what areas perhaps my current schedule wasn't addressing. Spending time here helped me as I began to take practical steps to implement WBN. 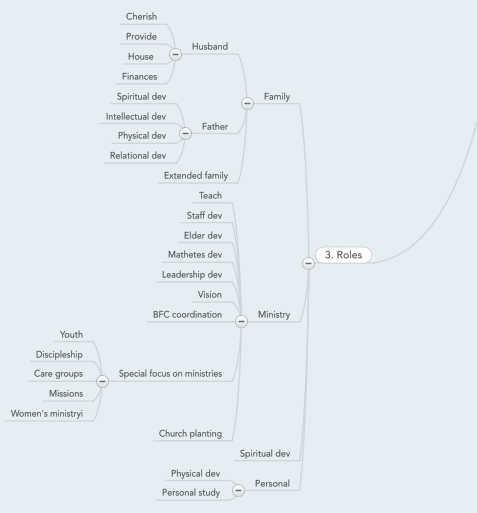 I now had a tool to measure what was the best thing on which I could focus my time based on the roles God has given me. When it came to "reducing," I referenced my roles in order to determine which cuts to make. Step Three: Reading About and Implementing "Architect" and "Reduce"
As I read through the sections on Architect and Reduce, I made significant changes, but I don't remember the order in which I did them. Getting Up Early. Perman calls this The 5 A.M. Rule. I've done well implementing this but I need to be more disciplined with the corollary of what I call The 10 P.M. Rule (if I'm going to get up at 5, I need to be heading to bed by 10). Daily Workflow: Every day, I look at my goals for week and decide what to do (I'll discuss this more in my next blog post). Weekly Workflow: Every week, I look look at my quarterly actions, projects, calls, etc. and determine the goals for the week ((I'll discuss this more in my next blog post). Quarterly Workflow: Every quarter, I look at goals, mission, etc. and evaluate what I want to accomplish in the coming months (Once again, (I'll discuss this more in my next blog post). Prayer and Scripture: Obviously devotion time should be a part of any believer's plan for effective work and ministry. Personal Development: As I began to architect my life, I worked in more time for personal development. Rest: I tried to make sure there is a healthy amount of time with my family and engaging in activities like running and swimming. Perman also suggests we "Reduce." There are four primary ways to reduce: Delegate, Eliminate, Automate, Defer. I mostly took notes in this section for future reference. In my next blog post, I'll describe the system I put in place to help me "execute" the system. 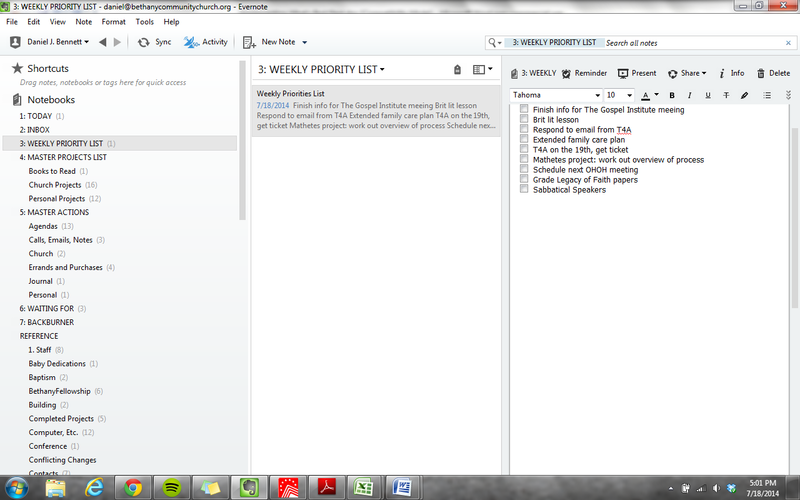 Evernote was extremely helpful and I'll show some screenshots of how I set it up. In the third and final blog post, I'll discuss the ongoing impact of WBN on my ministry and the ministry of the other staff.